We are proud to announce the release of the Armenian Spellchecker 3.0 for Microsoft Office Word 2007/2010/2013/2016 application. HySpell spellchecker is precise, fast and tightly integrated within Microsoft Word application. Because of its natural integration in MS-Word, it is extremely easy to use, and an ideal tool for beginner Armenian language students, as well as, professional Armenian writers. The lexicon of HySpell Spell-checker consists over 158,000 Armenian root words. It is based on Stepanos Malkhasianz and Edvard Aghayan prolific multi-volume dictionaries, as well as, the much older Haygaznian dictionary. Along with this root lexicon base, the affix rules of the spell-checker can span over 5 million Armenian legal words covering both Western and Eastern Armenian dialects. This leaves a very small margin of missing illegal words, while not compromizing any of the legal ones. Version 3.0 of the HySpell Armenian Spellchecker gives the end-user the option to select between Classical or Reformed Orthographies. Moreover, it also has the capabilities to convert between Classical and Reformed Orthographies. The mechanism of suggesting correct words to a misspelled word is fairly standard in the HySpell spellchecker. It is quite helpful specially in the case when the misspelled word differs by 2 or 3 letters from a legal word. This version of HySpell includes an internal small 18,000 word Armenian-Armenian dictionary. Moreover, word searches generate hyperlinks to the multi-volume Nayiri dictionaries for further more detailed defintions of the selected word. The HySpell spellchecker is equipped with enough intelligence to find Armenian content among mixed multiple language text. It does not need further manual language indicators when spell-checking an Microsoft Word document. Moreover, it identifies Armenian text in the two major encodings, namely UNICODE and the old ARMSCII-8 encodings. HySpell spellchecker is tightly integrated within Microsoft Office Word 2007/2010/2013/2016 application. This makes it very practical and easy to write professional Word documents in Armenian. Among its important features, it has the capability to add new word to the custom dictionary along with inflections, in this way extending the lexicon-base of legal words. Moreover, the spellchecker has an open architecture exposing even the internal lexicon-base and the affix-rules file for further linguistical custom tuning. The Armenian language is one of a handful of the Proto Indo-European languages that have survived more than 12 thousands years of evolutionary path originating from the heart of the Armenian Highland. We beleive that, a linguist cannot perform any reliable and complete research in Indo-European languages without the in-depth study of Armenian language. 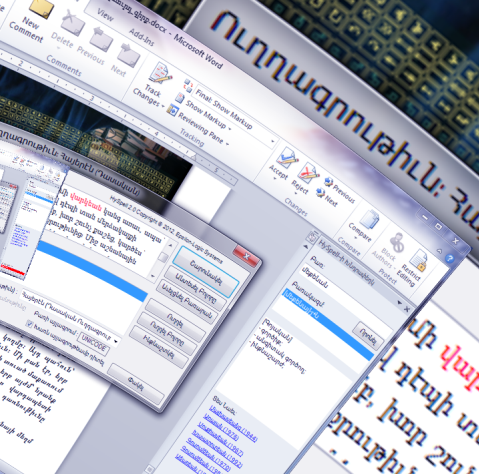 HySpell 3.0 is the second release of the Armenian spell-checker support for Microsoft Office Word, it includes among other features an Armenian-Armenian Thesaurus.